The Central New York Regional Information Center (CNYRIC) serves 50 school districts and four Boards of Cooperative Educational Services (B.O.C.E.S. ), across eight counties in the central region of New York State. 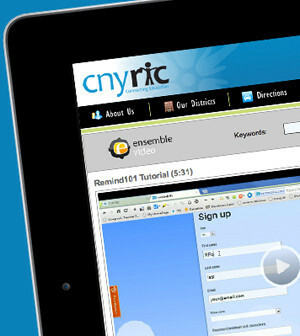 CNYRIC first began searching for a video platform because teachers needed to incorporate videos into classroom learning. 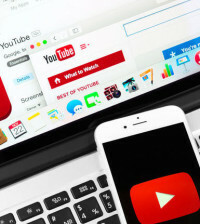 Free solutions, like Vimeo and Youtube, were typically blocked within the schools, as they are not considered safe sites for students to access. Teachers needed a way to store and share media that would be safe and secure for students to use, either within the school or at home. CNYRIC initially answered two districts’ requests for a video platform with Ensemble Video as a pilot program to meet these needs. Ensemble Video’s mission has always been to transform teaching and education, helping educators and school districts use technology to enhance learning. Key to that has been ensuring that technology integration was responsive to teachers’ needs, and easy to use, in order to minimize the time they spend in prep work. Within the school districts, Ensemble Video is used to enhance student learning. American Sign Language (ASL) classes are recorded when a teacher will be absent, and then published with Ensemble Video in Edmodo. ASL III students are also recording videos using iPads to share with the ASL I and II classes. High school math and science teachers are flipping their classrooms, having students create video presentations in order to teach their peers. Ensemble allows teachers to create a dropbox for student assignments, making video homework easy to collect, check, and then share with the class. Mary Ward teaches Honors Chemistry and AP Chemistry course at Fayetteville-Manlius High School. She decided to “flip” her Honors Chemistry class. “This means having them listen or read notes at night, and then the next day come in and do reinforcement exercises to help them further understand what they learned,” said Ward. Needed a secure means for students to access educational videos. Needed a secure means for teachers to upload and manage educational videos. Needed to reach the maximum number of schools with specialized teachers and programs through video learning initiatives. Needed to provide professional development courses and technology tutorials online for teachers for anywhere, anytime learning. Enhanced student learning through video-based instruction and flipped classroom experiences. Students have been able to participate in collaborative learning projects with other schools. Reached teachers with video tutorials, enabling them to enhance their instruction with e-learning opportunities. Click here to read the entire Ensemble Video CNYRIC case study.